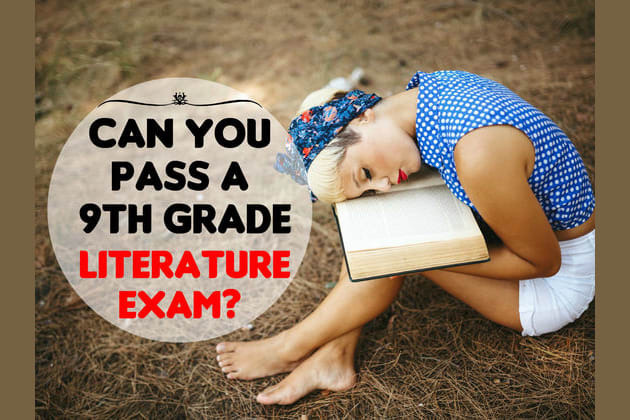 Can You Pass A 9th Grade Literature Exam? What is the 'catcher in the rye'? Where were Nick and Tom educated? How does Romeo commit suicide? Where do Huck, Jim, and Tom live at the beginning? In what century is the story of Hester Prynne set? On what writer did Harper Lee base Dill? Snowball teaches the animals to read and write. Holden contemplates about the fate of which animals in Central Park? What is Scout’s real name? Where does Gatsby’s reunion with Daisy take place? Where does Huck intend to go at the novel’s end? Where does Romeo go after being exiled from Verona? Where do Hester and Pearl live? Once back in New York, who is the first person Holden tries to invite for a drink? Who drives the car that kills Myrtle? Where does Boo leave presents for Scout and Jem? You almost passed a 9th grade literature exam! You almost passed a 9th grade literature exam! You have a free spirit. You love adventure; willing to step into the unknown and get lost. No wonder you find it hard to concentrate. You daydream, but observe everything, and view life as an opportunity for self-expression. So who cares if you don’t read the fine print. Good for you! You barely passed a 9th grade literature exam! You barely passed a 9th grade literature exam, but you really are a fine reader. You accept the challenge of being frustrated or confused, and you deal with it. You are curious, and recognize that a lot of learning isn’t fun. Nevertheless, you share what you’ve learned and never run out of questions. Take it as read! You passed a 9th grade literature exam! You passed a 9th grade literature exam! You read with purpose, and “go to the movies" in your head. You subconsciously use a variety of strategies while reading, and even make inferences and connections. You question and wonder, and believe you’re in control of the reading process. Did we read you loud and clear? You aced a 9th grade literature test! You aced a 9th grade literature test! You are an involved, motivated learner. You give your complete attention to reading and look for meaning between the lines. You probably guess at words you’re not sure of and create mental images. You’re a real bookworm and we love it!